I love to follow Bright Shiny Objects (BSO) and follow a trail to find possible distant relations. I think I overdid this one, though. That's OK.
My great-grandmother's brother was David Devier Smith (1864-1920), whose first wife was Leava Smith (1866-1959), born in Missouri, the daughter of Zachariah and Nancy (Gosney) Smith. They had one daughter, Eva Etta Smith (1890-1940), who did not have any children. Leava and David Smith divorced, and Leava married, secondly, Joseph Walton DeFrance (1865-1937), and they lived in San Diego. 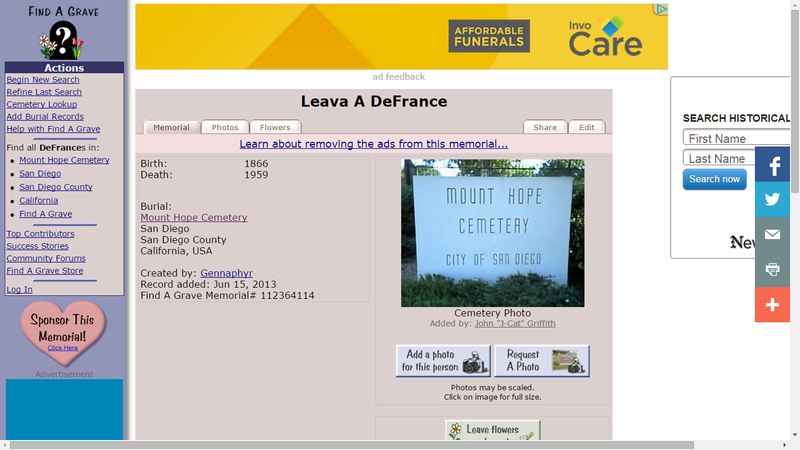 I see that I need to visit Mount Hope and take a photograph of her gravestone. Where's my To-Do list? 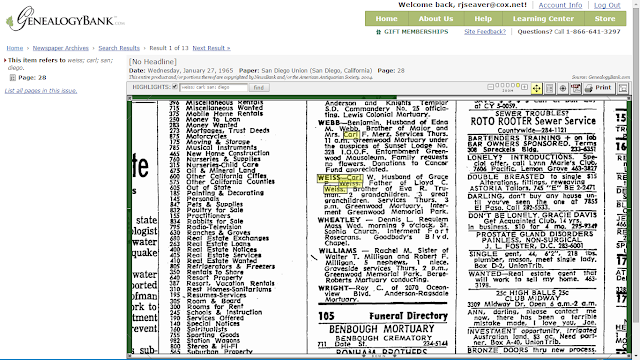 The California Death Index, 1940-1997 database on Ancestry provided her birth and death dates, and that her mother's maiden name was Gosslin (close to Gosney...wonder which one is right?). 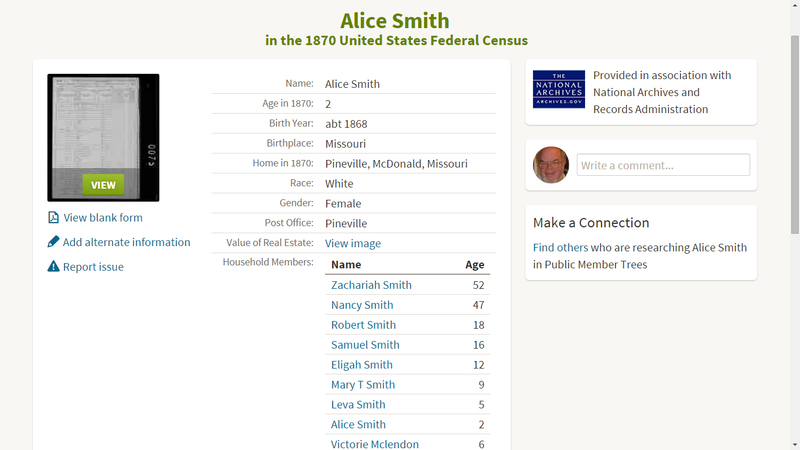 Yep, there is Alice Smith, age 2, born in Missouri, in the 1870 U.S. Census, daughter of Zachariah and Nancy Smith, residing in Pineville, McDonald County, Missouri. Alice must have married a Weiss and had a son Carl. 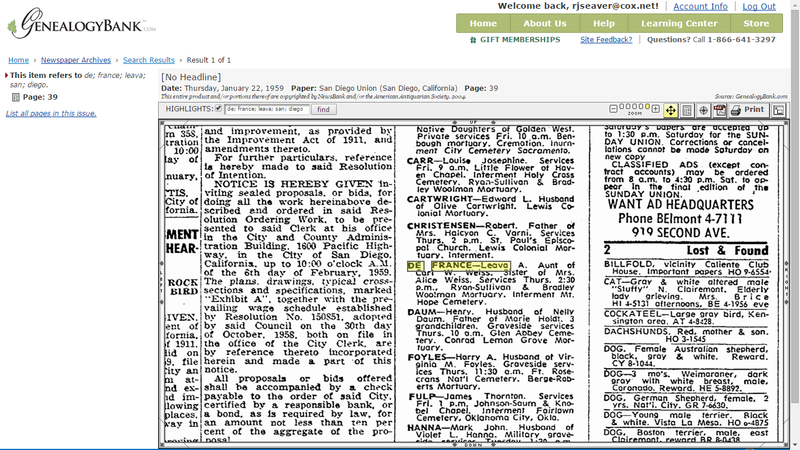 I easily found her in the 1920 U.S. Census, with husband Jakob Weiss and children Carl Weiss (age 33) and his wife Grace. 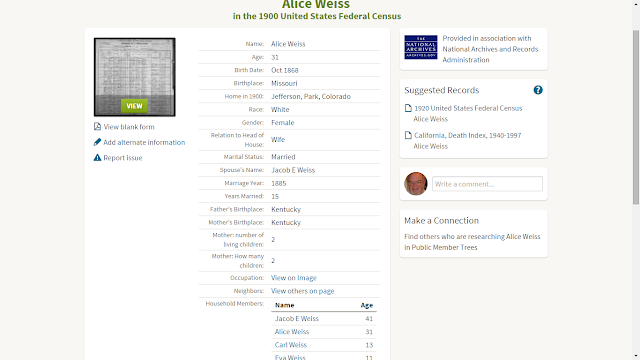 I found out that Jacob and Alice were married for 15 years in 1900, that Jacob was born in 1858 in Germany, and that Carl and his sister Eva were born in Colorado. What happened to Jacob and Alice Weiss? 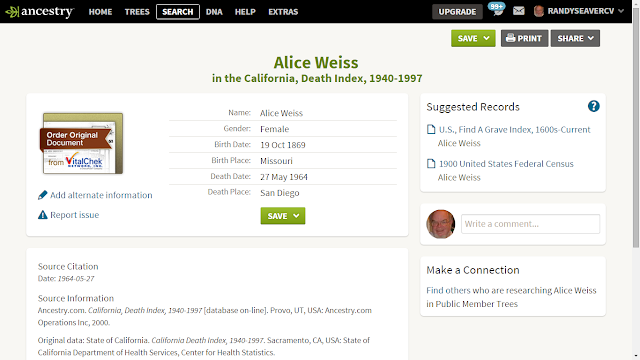 Alice is in the California Death Index, 1940-1997, which provided her birth date and death date; she died in San Diego County. 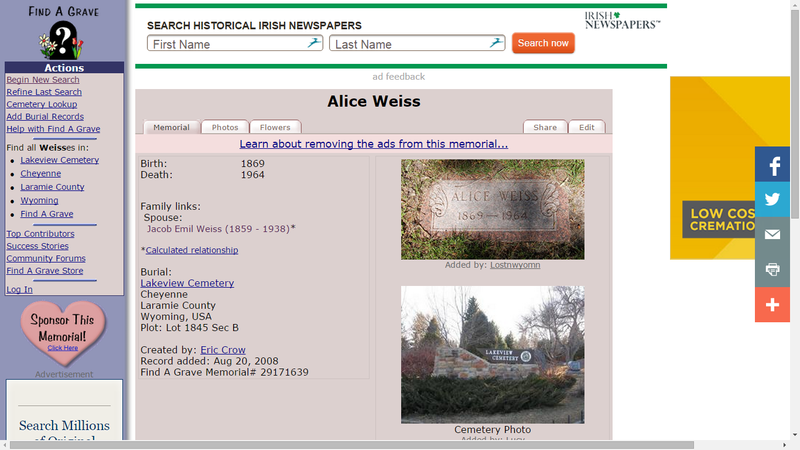 There is also a link to the memorial for Jacob Emil Weiss (1858-1938) who is interred in Cheyenne also. 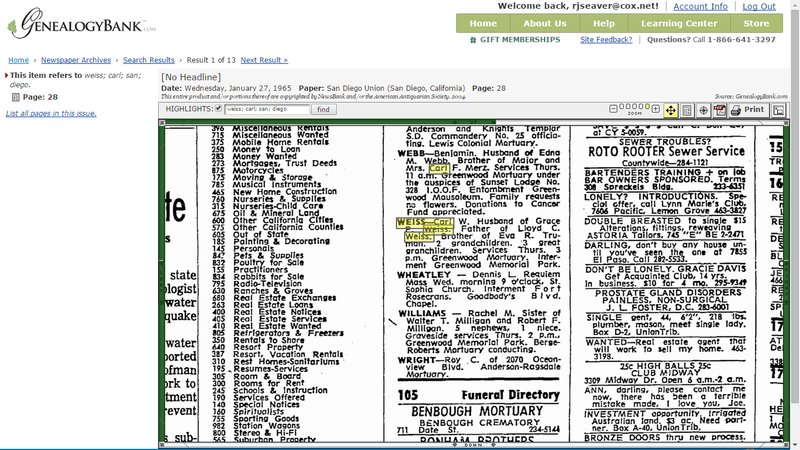 The death notice lists his wife's name and the name of his son, Lloyd C. Weiss, and the name of his sister, Eva R. Truman. I found their birth, death and spouse information also. 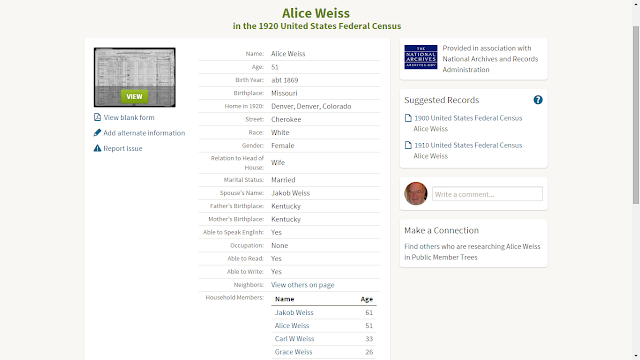 Alice was not in any Ancestry Member Tree, but she was in the FamilySearch Family Tree with Jake E. Weiss (with a marriage date in Colorado). I updated their profiles and added son Carl and daughter Eva. I decided that this was as far as I wanted to go down this rabbit hole, since I'm not related to them. Oh well, it was a fun research hour! Ten years ago, bopping down this research trail would have taken weeks or months and several trips to the Family History Center to search vital records, census records, and newspaper records. I know that there is not one original record in all of this; all of these records are derivative records, but they are, in general, derivative from the original records. Everything done here seems to hang together.